Never Too Late by Harold J. Fischel begins with Clint Crawley, who happens to bump into his old friends at a recent reunion and is shocked by the news of an impending financial disaster, finding his business threatened by banks. One of those friends, an old flame from his high school days, Sharleen, uses her connections with the underworld in helping him. Clint’s wife dies, he meets Sharleen off and on to her husband’s annoyance, and finally, they decide to move together to start a new life in Bermuda. There they ‘continue to be a magnet for people with strange stories,’ like Ana with a disadvantaged and mentally challenged young man, Mike, or Nina, a woman rescued from a local modeling agency which actually is involved with human trafficking. It is ‘never too late’ to make up for past mistakes and that is exactly what drives Harold J. Fischel’s novel by the same title. High school sweethearts Clint and Sharleen went their separate ways after graduation, but a class reunion brings them back together in an unexpected way. Clint is tapped out on financing for his restaurant, partially due to medical expenses for his wife, Jada. Sharleen has married a Mafia boss and has plenty of money at her disposal so she secretly backs a new loan for Clint. Jealousy and old-world mentality put both Clint and Sharleen in harm’s way, so they flee to the safety of the reservation where Sharleen was brought up. Together, they establish a restaurant in Bermuda where they encounter a number of different people who have special needs of their own. Clint and Sharleen try to help everyone, even when it puts them in danger. Can their love see them through or will the hardships of the world ruin their chance at love? Never Too Late is an exciting story about hope, forgiveness and second chances. 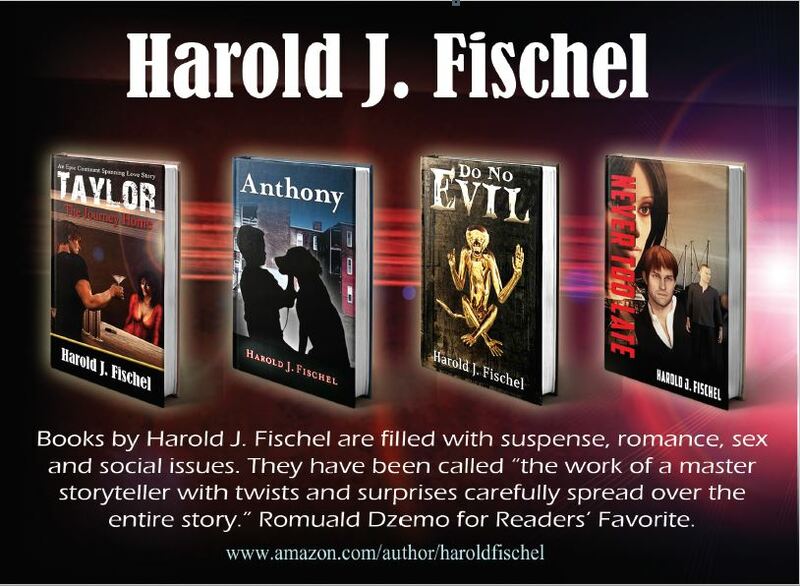 Harold J. Fischel presents a variety of social problems through the actions of the outstanding characters and demonstrates that love and understanding can go a long way in making the world a better place. Vivid descriptions of places and people, as well as exciting action and thought provoking dialogue, keep you turning the pages, anxious to see what happens next. Never Too Late is an entertaining and engrossing story that makes you alternately hold your breath and cheer as Clint and Sharleen navigate the issues that plague them. A rekindled love is a beautiful thing, but what happens when your lover has already found someone else? For the characters of Never Too Late by author Harold J. Fischel, this is exactly what occurs. Meet Clint and Sharleen, two star- crossed lovers whose different ambitions forced them to part to their own separate galaxies. When they are destined to cross paths again, this time it’s a bit more complicated. Both are married; Sharleen to a mafia boss and Clint to her best friend. Can you say awkward? When trouble strikes for Sharleen, it’ll take unfathomable courage and the help of her friends to get her through. Will Sharleen come out victorious and survive the odds, or has her time come? An inspiring tale of bravery, resiliency, and adventure; you do not want to miss out on this read! My favorite books are not only the books that will leave me reading at 1 a.m. because I’m hopelessly drawn in, but ones that bring attention to pressing social issues. Luckily for me, Never Too Late by Harold J. Fischel fits both descriptions. Not only is the book a romance and an adventurous tale, but Fischel uses the power of his words to draw attention to issues that are commonly ignored, such as human trafficking and the existence of mafias. Through this book, I gained a new perspective on these issues due to his relatable characters that put a mental image on the issue. This book was truly a treasure to read, and I give it my highest recommendation.